Woah o.m.g. that looks familiar for some reason hmmmmmmmmmmmmmmmmm. I wonder what it will be like for those who are first familiar with this game, and find the Chrono series in the future! Hilariously enough... I recall a fandom friend from years back had a crack theory that CT Frog was secretly CT Cyrus. I recall a fandom friend from years back had a crack theory that CT Frog was secretly CT Cyrus. So what did they think happened to CT Glenn if Cyrus=Frog? Just installed and started playing. Sounds interesting. Just so you know, there are a lot of Android emulators available, if you want to play it on PC. Know any good emulators? I've had bad luck with them. It's been a few years since I used an emulator, so dont know the current ones. Consensus on Reddit seems to be that Bluestacks is quite good. Nox seems to send your info to China, so dont use that. I've been really liking the game currently! It's very story driven, but also has an interesting (but simple) combat system. It might be a bit slow-paced during dialogue, but I dont mind since the stories are fun and interesting. Music is of course great! Some slight spoilers on the setting: The time eras seem to be 300AD, 1100AD and Antiquity (still dont know the exact year for Antiquity). 0AD is depicted to be the start of some kingdom. Ashtear resides in 300AD. I dont know whether she's Lucca, her ancestor/descendant or just fan service. I see the setting as a sort of opposite to the Chrono world. 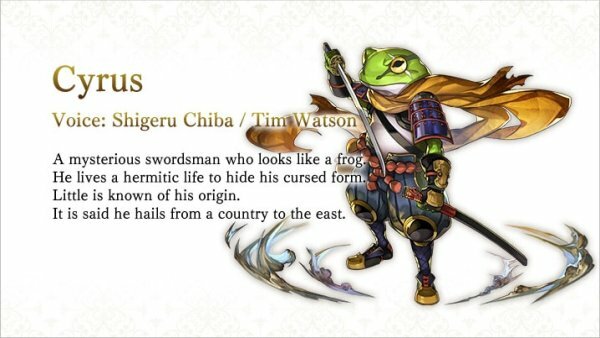 Main character uses a sword, while "Cyrus" the frog man uses a Katana (Opposite of Crono and Frog). The world in the future is floating in Another Eden (12,000BC in Chrono), while the Antiquity in AE seems well-being and civilizationally stable (like 1999AD in Chrono). Main characters are a brother and sister, so I think that theme is also similar to Chrono series. There is also a demi-human race called the Beasts in 300AD, that are angry at humans. I wouldnt mind a Another Eden subforum, where one could analyse the connections, stories and fan service in AE in comparison to Chrono. Ye gods. The game sounds amazing. Yea I think its very good. The difficulty after first few chapters is also quite challenging, not your basic "overlevel and 1-hit everything" type game. HEh, how cute, there's even a bucket in totally-not-End-of-Time. Only just showed up for me too. I found as a highlight the question about other ports other than the planned Switch one. Hopefully it does happen.